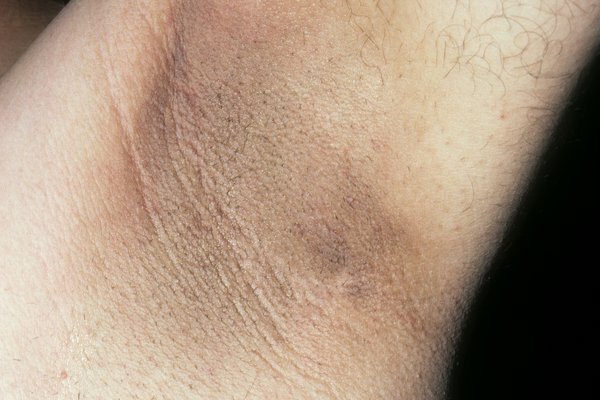 Acanthosis nigricans is the name for dry, dark patches of skin that usually appear in the armpits, neck or groin. It could be a sign of an underlying condition, so it needs to be checked by a GP. The main symptom of acanthosis nigricans is patches of skin that are darker and thicker than usual. They can appear anywhere on the body. The patches often appear gradually without any other symptoms. Sometimes the skin may be itchy. Although it's usually harmless, it's best to get any skin changes checked out. In rare cases, it can be a sign of something more serious, such as cancer. A GP can usually tell if it's acanthosis nigricans by looking at your skin. You may need some tests if they're not sure what's causing the patches. The most common cause of acanthosis nigricans is being very overweight. Sometimes acanthosis nigricans happens in healthy people with no other conditions. This is more common in people with dark skin. Once your GP knows what's causing the condition, they can recommend the best treatment. The patches should fade over time once the cause is treated. If you're very overweight, your GP may recommend losing weight. There's no specific treatment for the patches. A skin specialist (dermatologist) may be able to suggest treatments to improve their appearance, but finding and treating the cause is usually recommended first.